Cwen, a poor weaver struggling to make a living at Whitby Abbey, is accused of possessing a valuable necklace; if found guilty she could be hanged. Wulfrun, Cwen’s daughter, sets out to prove her mother’s innocence. Set in turbulent Anglo-Saxon times, this is the story of a resourceful dauntless heroine, determined and clever as the wolf that she is named for. 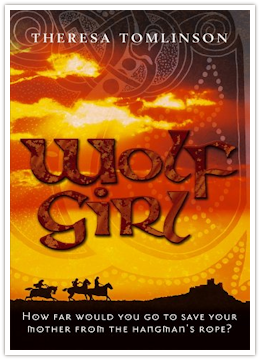 In WOLF GIRL, Theresa Tomlinson links her enthusiasm for creating strong adventurous heroines, with her interest in history and mythology of the North East Coast of England. This book is to be published February 2nd 2006 and is planned to be the first part of a trilogy. 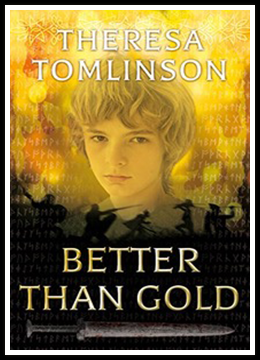 This Anglo-Saxon adventure tells the story of Egfrid of Northumbria - the young prince who was held hostage by his father’s worst enemy - the fierce King Penda of Mercia. Suitable from age 7years upwards - available in paperback and kindle.